On behalf of Annai Violet Arts & Science College NSS Unit – I & II,NSS Special Camp was conducted at two villages, Unit – I Ayappakkam, Unit – II Thiruverkadu (Koladi) from 03/12/2018 to 09/12/2018. Inauguration of the Camp was done on 03/12/2018 at Valluvar Vasuki Community Hall, Ayappakkam, by 3.00 pm. 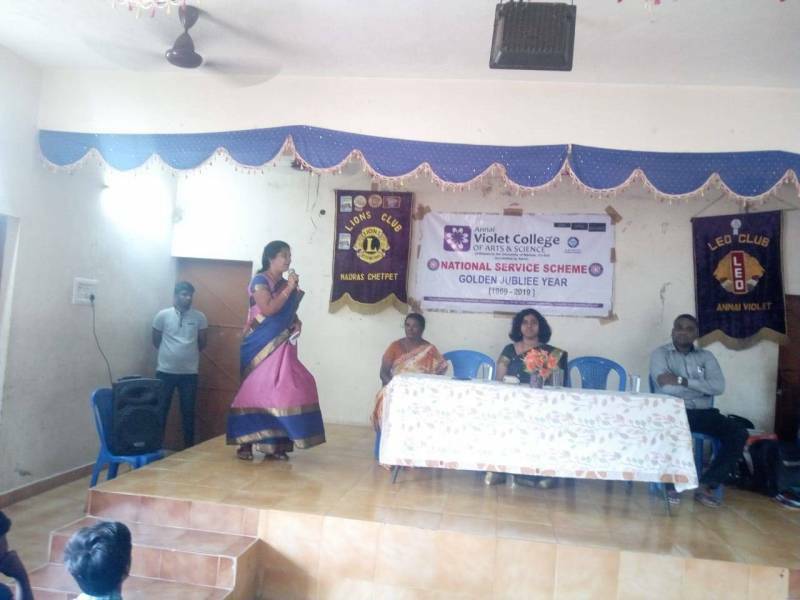 The Chief Guest of the day was Mrs.S.Chitra, Commissioner, Thiruverkadu Municipality, Mr.Samuel, Sanitation Inspector, Mr.Palani, Manager, Mrs.S.Punitha, Principal, Kids Pre-School (Ayappakkam), in the presence of our college Principal Dr.Kamala Balakrishnan, NSS Program Officers, Unit – I,Dr.L.N.Jayanthi, Unit – II Mr.V.Anbarasu, Staff Members and 99 NSS Volunteers. The Day started by doing Yoga, to keep themselves fit and healthy. A Special Speech on “Stress Management” was given by Dr.Chandramohan, Assistant Professor, Department of Bio Chemistry of Annai Violet Arts & Science College. Cleaning activity was done at Ayappakkam Community Hall, Public Park. Thuverkadu Park Cleaning.Pamplets were distributed to the public at Ayappakkam for Free Eye Check up which will bw conducted on 05/12/2018. Ms.Kanimozhi of II B.Sc BioChemistry, shared her experience about the Adventure Camp she attended at Manali. As a part of fitness, Yoga was done by the students. Free Eye Check up was organised in tie up with M.N.Hospital, Tondiarpet at Ayappakkam, Valluvar Vasuki Community Hall from morning 9.00 am to 1.00 pm. About 105 of the public utilised the service.Cleaning was done at Thiruverkadu. Breast Cancer Awareness Program was organised at Ayappakkam for which Mr. Ananda Kumar, Founder, President, India Turns Pink was the Chief Guest. Motivational Speech was given by Dr.Raja, Speaker for the students. The Day started with Yoga. Dengue awareness program was conducted, Mr.M.A.Rajendran, Non medical supervisor, DEL, DMS Campus, Menambedu, Ambattur, presided the program.Leprosy awareness program was presided by Mr.Nagarajan. Cleaning was done at Thiruverkadu, Green Park, Ayappakkam local areas and streets. EDP training was given by our alumini student Mr.Muthugurunathan. A special speech was given by Dr.Sathy, Associate Professor, Department of Hindi. Yoga was done.Cleaning – Ayappakkam Government Schools, Thiruverkadu Park cleaning. Village Panchayat meeting was conducted.Orientation Program was organised, for which Dr.G.Bhaskaran, NSS Co-ordinator,University of Madras was the Chief Guest. Tree Plantation was done at Ayappakkam government School, in the presence of Dr.G.Bhaskaran. Students enacted plays on various social awareness creating activities. The day started with Yoga, Cleaning was done at Ayappakkam Government Schools, Cultural program was organised. Students shared their experience , they learnt in the Camp. Yoga was done.Cleaning activities were done, Valedictory Program was organised, for which Mrs.Shiprah Stalin, Correspondent, Orange educational Trust was the Chief Guest, in the presence of NSS Program Officers Dr.L.N.Jayanthi, Mr.V.Anbarasu, Staff Members and Students.